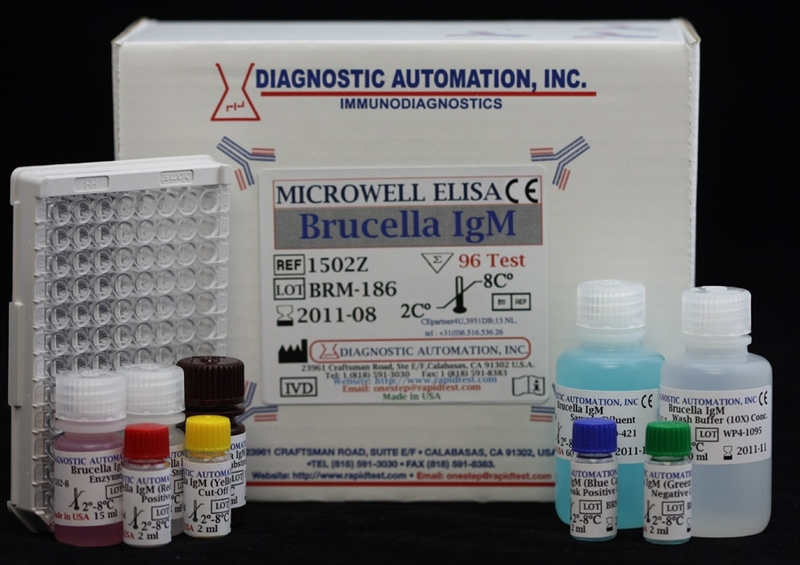 Brucella IgM ELISA kit - Brucella ELISA Assay | CE-GMP | 818-591 3030-USA. 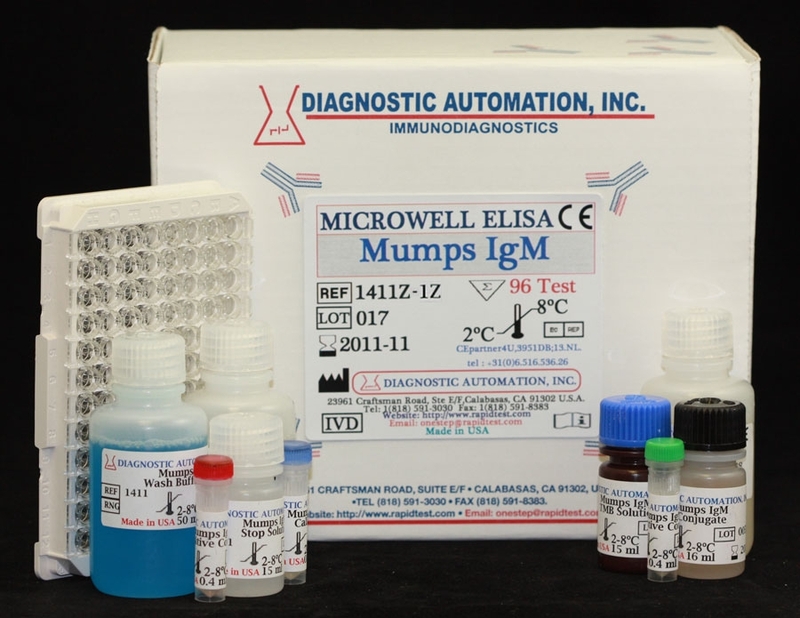 The Diagnostic Automation Inc. Brucella IgM Antibody ELISA Test Kit has been designed for the the detection and the quantitative determination of specific IgM antibodies against Brucella in serum and plasma. Further applications in other body fluids are possible and can be requested from the Technical Service of Diagnostic Automation Inc.
Brucellosis is an infectious disease caused by small ellipsoid, gram-negative bacteria. There are four different germs: Br. abortus, Br. melitensis, Br. suis and Br. canis. People are infected by contact with infected animals or by eating meat or drinking unpasteurized milk from infected animals. As a rule, infected humans are not contagious. Brucellosis is most frequent in young and middle-aged individuals. Endangered persons are butchers, farmers, owners of pets, veterinaries and tourists in Southern countries. The appearance of brucellosis shows a prevalence during winter and spring. The incubation period is between one and three weeks, but may be as long as two months. Br. abortus and Br. melitensis may cause Bang Disease or in rare cases Malta Fever. The first appears occasionally with a low pathogenicity for man. Typical symptoms for Bang Disease are periodically occurring fever, splenomegaly and swelling of lymph nodes. In some cases an inflammation of different joints and organs occurs. The Malta Fever is caused by the epidemic type of brucellosis, and infection almost always leads to a manifest illness. Some infections with Brucella can cause Brucella Hepatitis. It is possible that there is a link between an infection with Brucella and the outbreak of multiple sclerosis. During an antibiotic therapy or a chronic infection, the detection of Brucella spec. in blood, urine, cerebrospinal fluid, sputum or other body fluids could be negative. Serological methods like agglutination, complement fixation reaction, Brucella Coombs test and ELISA are good alternatives. 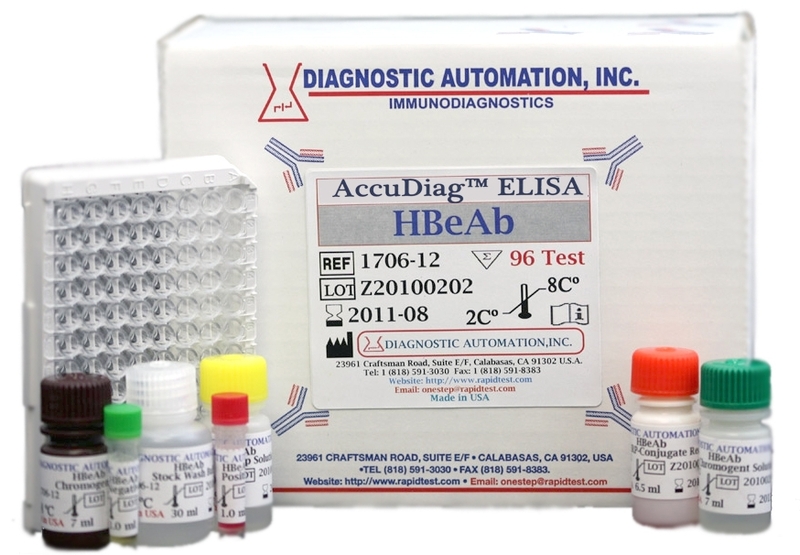 The monitoring of antibodies can serve as a usual indication of the status of infection. During the first days, IgM is the only immunoglobulin that appears. As the disease progresses, IgM recedes quantitatively and IgG becomes predominant. In chronic brucellosis, IgG may be produced for an extended period. 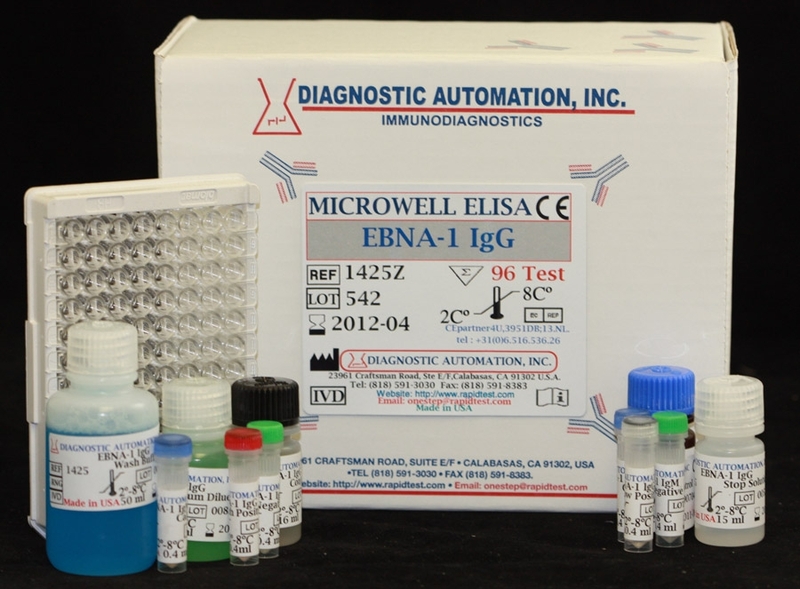 The Diagnostic Automation Inc. Brucella IgA antibody test kit is based on the principle of the enzyme immunoassay (EIA). Brucella antigen is bound on the surface of the microtiter strips. Diluted patient serum or ready-to-use standards are pipetted into the wells of the microtiter plate. A binding between the IgA antibodies of the serum and the immobilized Brucella antigen takes place.